Cooper Square Press, 9780815410508, 288pp. 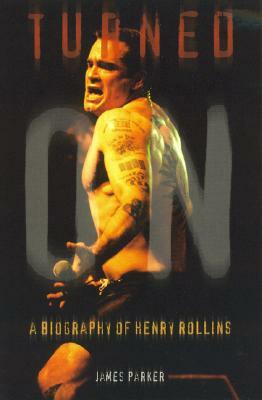 A celebrity like no other, Henry Rollins initially made his mark as the front man for the punk band Black Flag, and has since gone on to a successful musical career with the Rollins Band, along with spoken word performance tours, appearances in films, and the creation of his own publishing company (2.13.61). He has remained an uncompromising icon of American alternative culture, a man to whom unrestrained expression is not just a career, but the reason for living. Unlike nearly every other rock 'n' roll celebrity, Rollins has avoided the usual wallowing in booze, orgies, and medication in favor of pumping iron, performing constantly, writing furious diatribes against complacency and passivity, and repeatedly attempting to rip the scales from the eyes of a brainwashed populace. His performances are karate chops of information, thought-provoking and dangerous. Turned On is a look at the circumstances, alliances, and conflicts that made Rollins the force he is today. Biographer James Parker starts off in Washington DC, birthplace of Henry Garfield, and chronicles the development of his drive and rage. Parker shows how skinny skate-punk Garfield hooked up with his favorite band, Black Flag, and remade himself as part-animal, part-machine Henry Rollins. Parker examines at length the punk scene of the early to mid-eighties, when Black Flag toured with few breaks, going into towns where no punk band had ever been and preparing the ears of the nation for the harsh new sound. A historian of the punk movement as it migrated from London to New York to Hollywood, Parker recreates the era, covering the bands, the places they performed, and the riots over which they presided. Interviews with cohorts, members of Black Flag, roadies, musicians, film directors, and music professionals provide a multifaceted look at Rollins. Above all, Parker examines Rollins' music, giving informed reviews of the noise Rollins has brought to this world and deciphering what the music says about the man. Turned On is the story of Roll.